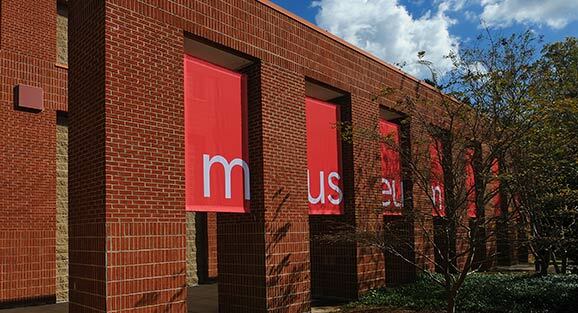 The University Museum is open to the public 10 a.m. – 6 p.m., Tuesday through Saturday. The Museum is closed on Sunday and Monday and regular University holidays. 10:00 a.m. – 4:00 p.m., Tuesday through Saturday; 1:00 p.m. – 4:00 p.m. on Sunday. Rowan Oak is closed every Monday, as well as July 4, Thanksgiving, December 24, 25, 31, and January 1. Bailey’s Woods Trail and the grounds at Rowan Oak are open from dawn to dusk daily. The public is invited to attend all exhibition openings and Brown Bag lecture series, Free Sketch Fridays, and for Family Activity Days, all ages are welcome. A bike rack is conveniently located next to the side entrance of the Museum. Restrooms and water fountain are just inside the side entrance. The grounds at Rowan Oak are open without charge. Visitors should allow an hour to tour the Museum galleries. Guided tours are available upon request and group tours are welcome with advance notice. If you are interested in booking a group tour, click here, email the Curator of Education at esdean@olemiss.edu, or call 662.915.7073. Allow a half-hour to walk the Bailey’s Woods trail between the Museum and Rowan Oak. For guided tours of Rowan Oak, call 662.234.3284. Tour materials for Rowan Oak are available in Spanish, French, German, Italian, and Japanese. The University Museum’s facilities are handicapped-accessible. If you require special assistance relating to a disability, please call 662-915-7084.